HA NOI (VNS) — A parking tower system commenced operations yesterday morning on Tran Nhat Duat Street in the Hoan Kiem District of Ha Noi. The tower will aim to meet the district residents' demand for parking space and help the city remove its numerous ground parking lots, which are currently taking up space on the city's streets, and therefore improve the traffic situation, Pham Van Duc, deputy director of the Ha Noi Parking Company, said. 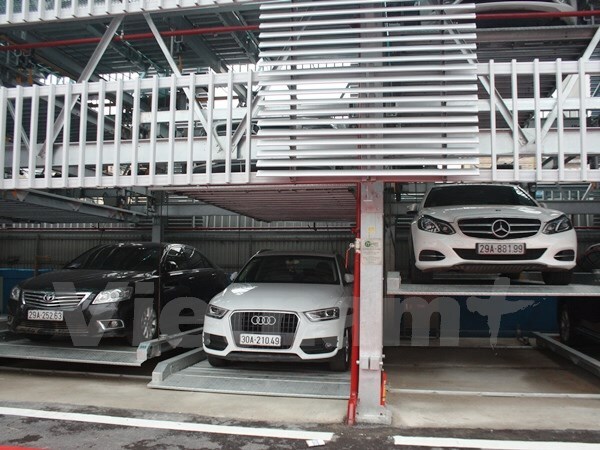 The Deputy Chairman of the Ha Noi People's Committee Nguyen Quoc Hung, said the city's demand for parking space was high and current parking lots had not been able to meet the demand. Hung said the city plans to add more towers to ramp up parking space and the Tran Nhat Duat Street's tower will serve as a model for other towers to be built in the future. "A parking tower has four times the capacity of a ground parking lot, given the same square footage. This model is the answer to the city's on-going problem of very limited parking space," said Hung. He also said the city will encourage the establishment of other parking towers and underground parking lots using the public-private partnership investment model. Situated on a 412sq m land lot and built using Japanese technology, the eight metre-high, four-story tower has a capacity to park 91 sedans or SUVs. The system allows a car to be parked or retrieved in just two minutes. In case of power cuts, the system's emergency power supply will have enough power to safely finish on-going tasks.